Oops - we don't appear to have a video for the fi-5650C. Paper handling can be a headache with some scanners, but not with the Fujitsu Fi-5650C document management scanner. A unique feature of the Fi-5650C is the dual control panels allowing easy access to both left and right handed operators alike. 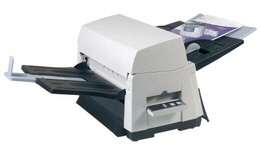 Its automatic document feeder will handle up to 200 sheets at a time, freeing you to do other things. The hopper can accept both square edge and fanned paper stacks helping to eliminate paper jams and increase overall scanner productivity. To improve the accuracy and reliability of scanning the Fi-5650C incorporates ultrasonic double feed detection.